Rescuers battled rough seas in the central Philippines on Sunday to search for more than 800 people missing after a passenger ferry sank as a powerful typhoon pummelled the country, officials said. A coast guard rescue ship reached the waters off Sibuyan Island, 300 kilometres south of Manila, where the MV Princess of the Stars sank after running aground on Saturday amid heavy rains and huge waves spawned by Typhoon Fengshen. "We still haven't found anything," coast guard spokesman Lieutenant Armand Balilo said. "We will continue with the search overnight." But Sulpicio Lines, owner of the 24,000-tonne ferry, said bad weather was preventing rescuers from reaching nearby islands where survivors could have drifted. "Sulpicio Lines has also dispatched one rescue vessel, but because of the bad weather, it has been difficult," said attorney Manuel Espina, a spokesman for the shipping company. "Even the coast guard ship had to anchor because of the huge waves." 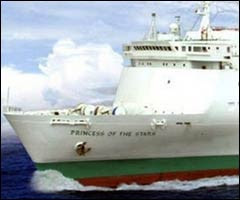 Espina said the Princess of the Stars was carrying 724 passengers and 121 crew members on its way to nearby Cebu province from Manila when it was battered by rough seas. The ferry left Manila Friday evening and was supposed to arrive in Cebu on Saturday afternoon. Senator Richard Gordon, chairman of the Philippine National Red Cross, said 10 bodies have been recovered from the shores of San Fernando town, bringing to 128 the death toll in the onslaught of Fengshen. Only four survivors from the ferry sinking have been found, according to town Mayor Nanette Tansingco. "We are seeking help from everyone who can assist in the search and rescue operations because we are still not seeing any more people in the area," she said. Inspector Reynaldo Reyes, police chief of San Fernando town, said among the recovered bodies was that of an old woman tied to a foam mattress she had apparently used as a floater. "There were few items found on the shores," he said. "We fear that more bodies are trapped inside the ferry." Among the survivors was Renato Lamorias, a janitor in the ferry, who said the vessel was forced to slow down "because the winds and the rain were strong." "We were eating lunch (on Saturday) when the boat suddenly tilted," he said. "We were told to put on our life vests and to abandon ship, and that's what we did." "Many of us jumped into the sea, but many were also left behind," he added. "Those who were not able to jump are probably dead already inside the ship." Lamorias said most of those who were unable to jump overboard were children and elderly passengers. President Gloria Macapagal Arroyo, who left for a 10-day trip to the United States on Saturday, scolded coast guard chief Vice Admiral Wilfredo Tamayo during a conference call for allowing the ferry to leave Manila despite a typhoon warning. Sea travel is a major mode of transportation in the Philippines, an archipelago of more than 7,000 islands. The country was the site of the world's worst peacetime shipping disaster in 1987, when more than 4,000 people perished in a collision between the ferry Dona Paz and an oil tanker off the central island of Mindoro just before Christmas. Elsewhere, 82 people may be dead from flashfloods and landslides caused by the typhoon, although only eight were confirmed, according to National Disaster Coordinating Council Executive Director Anthony Golez. More than 366,000 were affected by the storms and of them, 70,717 had been evacuated, according to an earlier report from the council. The eye of Fengshen, the seventh storm of the northwestern Pacific cyclone season, was over Tarlac province, northwest of the capital city of Manila, packing winds of up to 120 kilometers per hour at 4 p.m. local time, according to the Philippine Atmospheric Geophysical and Astronomical Services Administration. 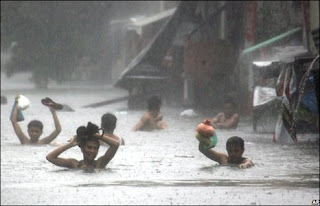 It is moving toward the northwest coast of the main island of Luzon, the weather bureau said. Storm debris is hampering restoration of power to areas of the capital blacked out when the storm blew through. 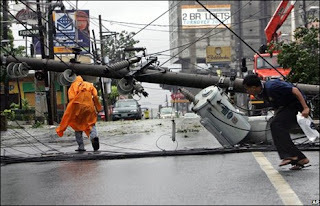 Manila Electric Co., which serves the capital and nearby provinces, said a 10th of its total network remained without power as of 3 p.m.
Power has been restored to mass transit lines in Manila, the electricity company said. Some power lines in southern Luzon are still being repaired, the state-run power transmission company said. Service has been fully restored on Cebu and Bohol islands in the central Philippines, according to National Transmission Co.
At least 30,000 residents of Iloilo City were stranded on their rooftops after the typhoon caused a dam to overflow and sparked power outages across the province, the Philippines Inquirer reported citing Jed Mabilog the city's acting mayor. In the eastern Bicol region, the storm forced more than 200,000 people to evacuate their homes, the newspaper said, citing a civil defense official. Arroyo arrived in the U.S. last night for a 10-day visit, according to the report. Yesterday she ordered warnings to be issued to all provinces in the storm's path. 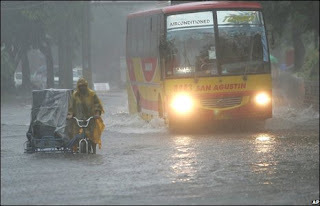 The Philippines is regularly hit by typhoons and tropical storms that gain strength over warm waters of the Pacific before lashing the coast. At least 26 people died in November last year when two typhoons struck the country. Fengshen is named after the God of Wind in China, according to the Web site of the Hong Kong Observatory, which lists names used for tropical storms and typhoons formed in the northwest Pacific. Why would they let the ferry 'set sail' in such conditions?